Learn how to create a multipart POST or PUT request from scratch, and see a demo to create and update a file in Google Drive using both POST and PUT requests from JMeter. Simulating a file upload in a JMeter test is fairly straightforward and easy. 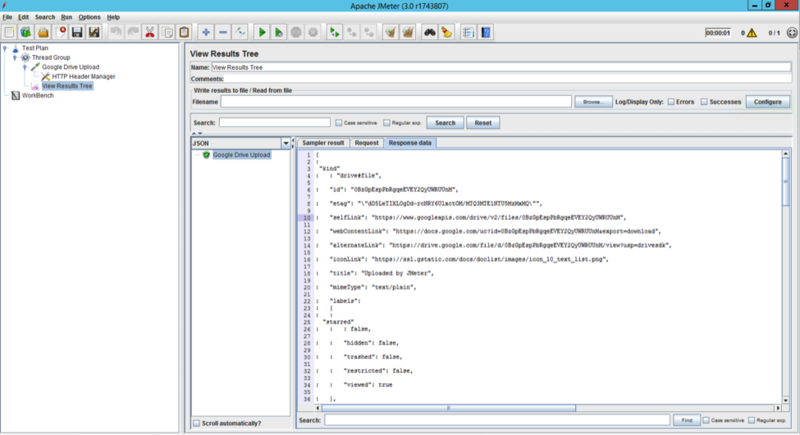 This blog has covered the topic in Performance Testing: Upload and Download Scenarios with Apache JMeter. Given that you provide a valid path to a file (either full or relative) and check the Use multipart/form-data for HTTP POST box in the HTTP Request sampler, it shouldn’t be a problem to upload a file to the server and collect the relevant performance metrics. However, the above approach does not cover every possible scenario. When it comes to passing additional parameters along with the file upload request, or using an HTTP method other than POST (i.e. PUT or PATCH), the usual instructions for uploading files with JMeter might not be applicable. In certain scenarios, for example, if you need to test a file upload via some REST API endpoint, you will need to build an HTTP request manually. This article will explain how you can create a multipart POST or PUT request from scratch. NOTE: All examples below assume using Google Drive REST API to upload new and update existing files in Google Drive. It’s important to note that the “Use multipart/form-data for POST” box is not checked. Second, you need to provide some authentication information so that Google Drive can recognize your account and add the document to it. Google Drive uses OAuth2, so you need to provide a valid OAuth token along with the request. There are several ways of obtaining the token, and you might want to check out our How to Run Performance Tests on OAuth Secured Apps with JMeter guide for comprehensive information on bypassing OAuth challenges in JMeter tests. The parts should be split by a multipart boundary, a free form separator which acts like an "&" character in non-multipart requests parameters, so that the server is aware where one part of the multipart request ends and the next part begins. To send these 2 headers with your HTTP Request, add an HTTP Header Manager to your Test Plan and configure it so that it looks similar to the below image (you need your own OAuth token and may change the boundary to whatever you like. A good practice is having it be randomly generated via the __RandomString() function. The above configuration assumes the plain text “Hello from JMeter” file inlined directly in the request body. If you want to upload an existing file, you can use the __FileToString() function. As you can see from the View Results Tree listener, the request is successful and the Google Drive API endpoint responds with the uploaded file’s metadata in JSON format. Choose and appropriate the “Method” using the dropdown menu in the HTTP Request Sampler. Change the endpoint URL if required. Amend the request body according to your needs. Regarding point number 2, in the case of Google Drive API Update method, you need to substitute the ?uploadType=multipart URL part with the previously uploaded file ID which can be extracted via either the JSON Path PostProcessor or the JSON Path Extractor. Finally, it’s time for a demonstration of creating and updating a file in Google Drive using both POST and PUT requests originating from JMeter. On the left side, you can see JMeter executing the file upload and file update requests, and on the right side, there is a Google Drive application opened in a browser where the file appears and is being updated. Hopefully, now you know how to manually build a multipart upload request and how to issue both PUT and PATCH requests. If the HTTP Request sampler still doesn’t provide enough flexibility to accomplish your test scenario, you can consider using HTTP Raw Request, available via the JMeter Plugins project. It provides total control of headers, cookies, content, etc. However, in 99% of use cases, JMeter’s HTTP Request sampler should be enough. If anything remains unclear, feel free to use the comments form below to ask your question or share any form of feedback. Published at DZone with permission of Dmitri Tikhanski , DZone MVB. See the original article here.